Jamie Dimon is betting big on the technology behind 'fraud' bitcoin. JPMorgan Chase said Monday it is launching a blockchain-based system with two other banks to reduce global payment transaction speeds "from weeks to hours." 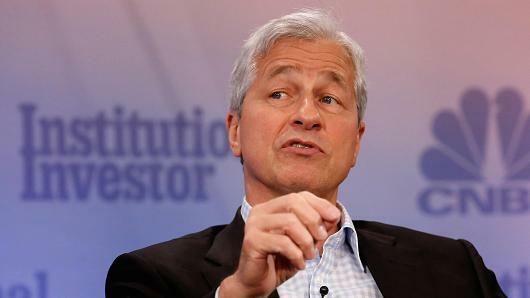 On Friday, JPMorgan Chairman and CEO Jamie Dimon said he sees potential in blockchain, but said "if you're stupid enough to buy [bitcoin], you'll pay the price for it one day." Blockchain creates a quick, permanent and transparent record of transactions, eliminating the need for third party verification. The largest U.S. bank is investing in the blockchain technology behind bitcoin, despite its CEO calling the digital currency a "fraud." In September, JPMorgan Chase Chairman and CEO Jamie Dimon said bitcoin is a "fraud" that "won't end well." Dimon added Friday that if people are "stupid enough to buy" bitcoin, they will pay the price for it. JPMorgan Chase announced Monday the launch of a blockchain-based system that will "significantly reduce" the number of parties needed to verify global payments, thereby cutting transaction times "from weeks to hours." Royal Bank of Canada and Australia and New Zealand Banking Group are JPMorgan's partners in the project, called the Interbank Information Network. Blockchain technology eliminates the need for a third party intermediary by creating a permanent, open record of all transactions on a network. That way, a buyer and seller can interact directly, while their exchange is recorded almost immediately on the blockchain. Proponents say applications of the technology with the most potential include speeding up financial transactions and bringing banking services to underdeveloped countries. "If you're stupid enough to buy [bitcoin], you'll pay the price for it one day," Dimon said Friday at an event hosted by the Institute of International Finance. He added he could care less about what bitcoin trades at. The digital currency has run up six times in price this year to a record high of $5,856 Friday. Bitcoin traded lower near $5,675 on Monday, according to CoinDesk. But at the same talk Friday, Dimon praised the technology behind bitcoin. "The blockchain is a technology which is a good technology. We actually use it. It will be useful in a lot of different things," he said. "God bless the blockchain." JPMorgan is already involved in blockchain-related projects. In 2015, the company began working on Quorum, an open-source, enterprise-grade transaction network focused on data privacy. The platform is built on the network behind the digital currency ethereum. Blockchain is "transformational for the financial services industry" and JPMorgan is "working hard [and] investing money" in it, the bank's chief financial officer, Marianne Lake, said during Thursday's third-quarter earnings conference call. Major Wall Street executives are divided on whether bitcoin is a good investment. But just about all the major banks are researching blockchain, if not developing related projects. Leaders from banks such as TD Bank, Mizuho Financial Group and National Australia Bank are working with IBM to develop and deploy a system for sending payments across international borders nearly instantaneously using blockchain, the technology company said Monday. The IBM project uses digital assets issued on a network run by a U.S. nonprofit called Stellar. A New Zealand financial services firm called KlickEx, the initial subscriber to the network, handles the currency conversion. The entrance of major companies into blockchain only emphasizes the distinction between the technology and high-flying bitcoin prices. "IBM's long game doesn't hold up cryptocurrencies as the answer," Jesse Lund, head of blockchain and distributed ledger market development at IBM, told CNBC in a phone interview. Instead, Lund expects financial institutions to back the digital assets of the future. He left his role in blockchain development at Wells Fargo for IBM in January. JPMorgan's Dimon also supported government-backed digital currencies during his remarks Friday. "Crypto sterling, euro, yen, they are all fine," he said. But for something like bitcoin, "I don't personally understand the value of something that has no actual value."